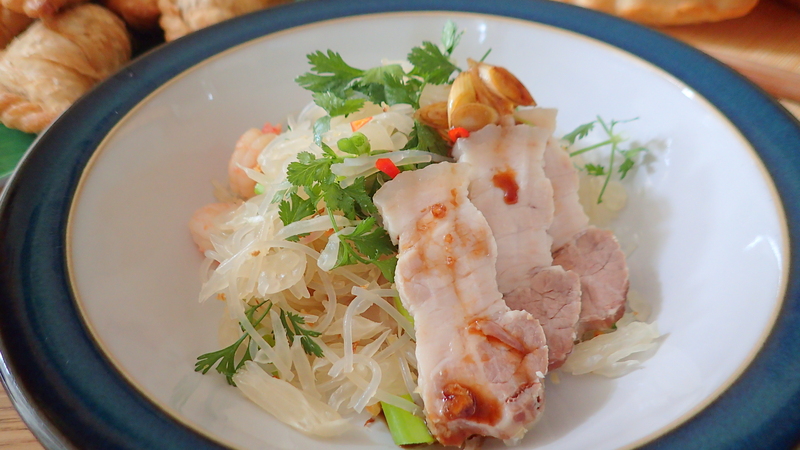 Pomelo, prawns and cellophane noodles salads is my final decision. A friend gave me a pomelo a couple of weeks ago and I have been wondering what to do with it. I know that some medicines may interact dangerously with pomelos and some pomelo hybrids, including grapefruit, some limes, and some oranges and I am taking one medication that makes it not so great for me to mix pomelo though I am very partial to the pink fruit variety. Hence I have been wondering what to do with my gift. I wanted something fresh. As luck would have it, the friend is coming here for lunch so I have decided to feed it back to her in the form of a salad, a pomelo, prawns and cellophane noodles salads. To my utter surprise the hubby love it too! Peel the pomelo and separate the flesh. 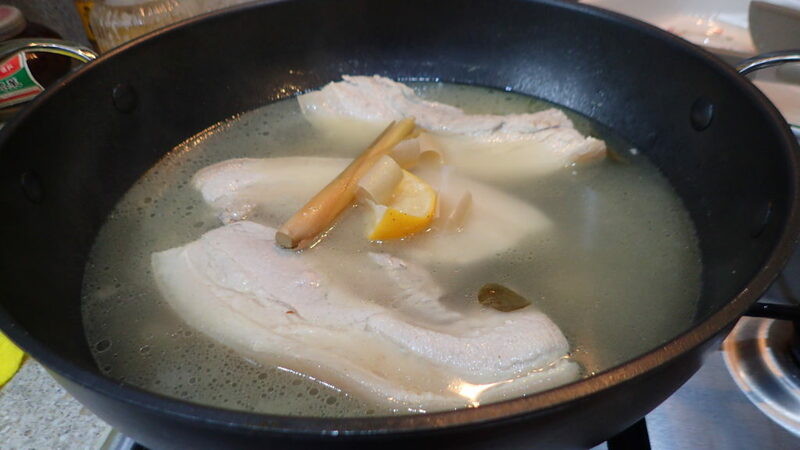 Place the pork belly, lemon grass, kiffir lime leaves, torch ginger flower,lemon juice and salt. Bring to boil and keep boiling for 20 minutes or so then turn off heat and let it cool down before removing the pork belly and slice thinly. Vinegar, chilli and soy sauce dip – adjust to your taste. 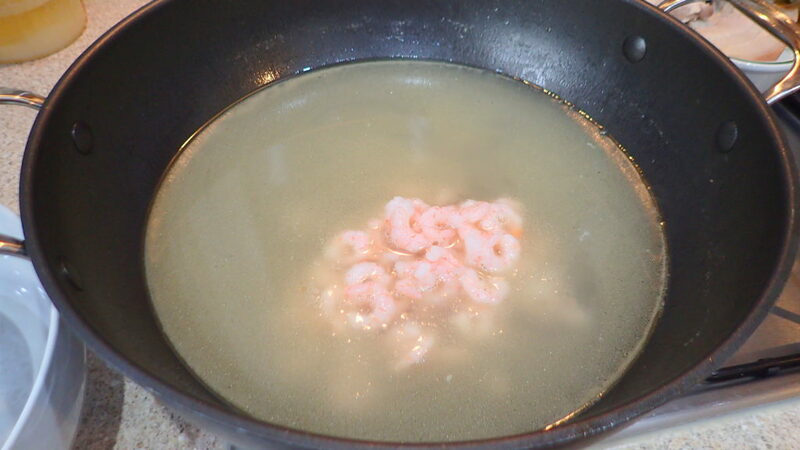 Bring the stock to boil again and give your prawns a rinse. 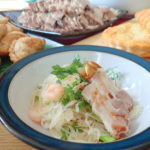 Soak the cellophane noodles in the stock of your pork belly till soft. Remove and set aside. 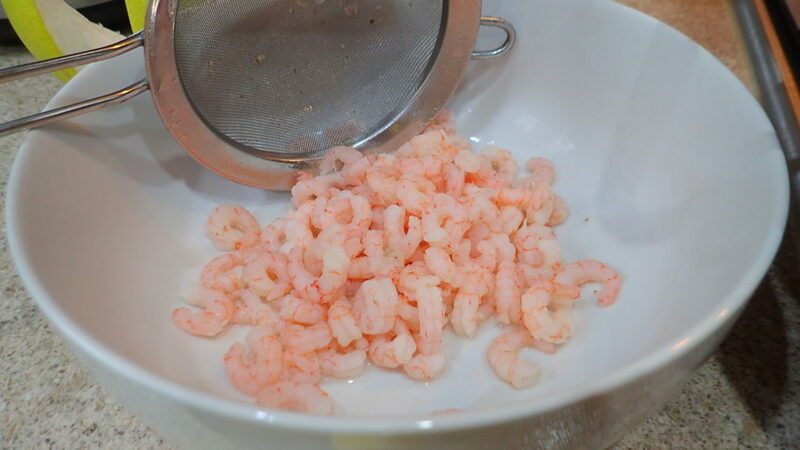 To assemble mix the prawns with the cellophane noodles and add in the minced chillies. 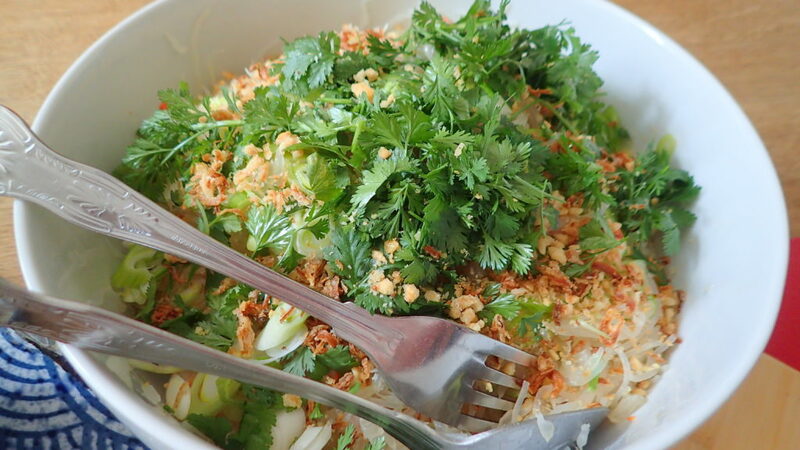 Season with lemon juice, coriander, soy sauce, fish sauce and freshly ground pepper. Please add a tablespoon of brown sugar into the seasoning if you like. As I have to be on a sugar ration I usually omit. Adjust the recipe to suit your taste. A bit more sour, sweet or spicy is entirely up to you. TIP – Prepare and pack everything in your fridge and assemble at the last minute as this salad is served cold. Very easy if you’re going out shopping with friends then come home for a cuppa and an impressive light lunch.